Flood Snakes & Ladders is an interactive workshop aimed at policymakers and practitioners working in disaster risk reduction across Europe. This live simulation activity uses data from children affected by flooding in the UK. You will be taken on a journey highlighting what it’s like for children before, during and after a flood. The workshop will help you to understand children’s experiences of flooding and will open up a discussion as to how and why they need to be involved in disaster risk management. The workshop was designed for policymakers and practitioners working in disaster risk reduction to help them better understand children’s experiences of flooding. The session centred on a live, interactive ‘game’ and discussion. The workshop, attended by about 20 people, began with an introduction explaining how the game was developed. Using data from the Children, Young People and Flooding project (2014-16) conducted by Lancaster University and Save the Children, workshop participants were taken on a journey highlighting what it’s like for children before, during and after a flood. After playing the game, participants worked in groups to reflect on what they had learned and think about the implications for their own practice. The interactive workshop introduced a unique perception of disasters (floods in particular) contributing to a more efficient and informed disaster risk management in Europe. 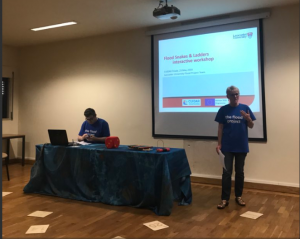 As practitioners and policy-makers have reduced amount of information regarding the actual effects of a disaster, the workshop presented a live simulation built upon the information gathered from children who were affected by flooding in the UK. 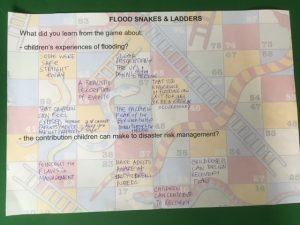 The simulation was a redesigned but well-known game, called flood, snakes & ladders, which provided a glimpse of the difficulties and pain children have to face and endure during and after a flood. The game was chosen due to its the nature: it is coined as a game of chance. As children often feel powerless, especially during/after a disaster, the game can effectively foster the appropriate anticipation of the better and worse days victims can have. The game and the workshop itself was built on the findings of a recovery and resilience project (conducted between 2014 and 2016) focusing on flooding, which is the primary hazard in the UK. The project involved two separate groups of children: an elementary school group from a rural area and a high school group from an urban area. During a series of day-long workshops the children shared their experiences through interviews, photos, various forms of art, literary compositions and solutions to the hazard as well as a flood manifesto. The game incorporates these materials and lets the audience (who actually played the game with the assistance of the presenters) understand children’s experiences of flooding. After the game the participants discussed various aspects of disaster risk management and raised the need for inter alia the inclusion of flood education in schools; carrying on the messages so children don’t have to go through the same horrors again; the development of training materials targeted to teachers and parents, etc.